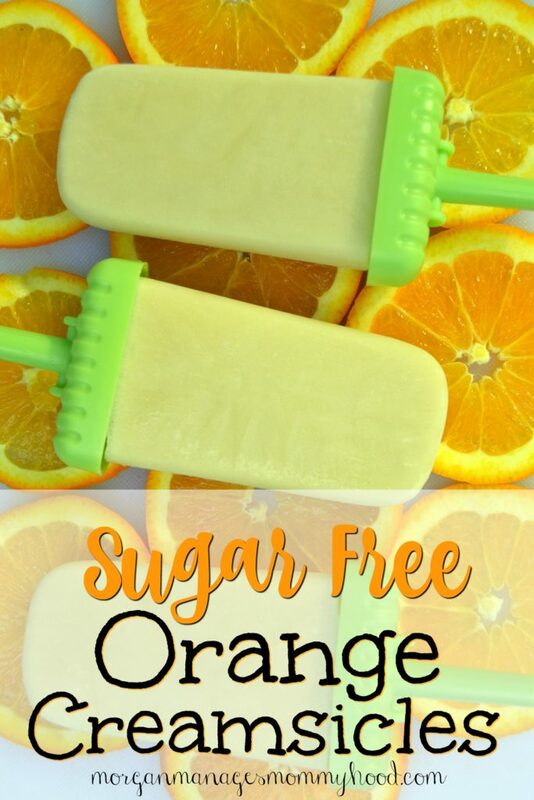 These sugar free creamsicles will cool you off without all of the processed junk! You can feel good about serving these 3-ingredient popsicles to your family. This post was originally posted on June 4, 2016 and has since been updated for user experience. Although summer won’t be here for two more months, I cannot wait for it to arrive in NJ! I’m craving a sweet, icy treat and a suntan like nobody’s business. I love sugary ice cream and popsicles like anyone else, but all of that sugar makes me not so bikini ready. That’s how these delicious 3-ingredient sugar free orange creamsicles came about! Did you ever eat creamsicles as a kid? I used to love eating them in layers – I was a weird kid. I’m a little too lazy to make it all super fancy by layering the vanilla component inside of the orange component. But these simple sugar free creamsicles are just as delicious and a million times easier. Oh, and with a kick of healthy fats and vitamin c they’re much better for you! To make these sugar free creamsicles you may need..
You can use whatever popsicle molds you have on hand, but in this post, I used these. They have a little bit of a base to catch drips. I also LOVE these super fun popsicle molds that are 3-D dinosaurs. They’re so cute and the “stick” is a fossil! Refrigerate the coconut milk until the white creamy part is solid enough to remove from the liquid. Overnight is best. Melt or allow to come to room temperature and soften before mixing in the orange juice and vanilla. Whisk until fully incorporated and pour into molds. Freeze until fully frozen through. Enjoy! If you think you’d like your pops a little sweeter, I suggest using vanilla stevia to taste in place of the vanilla. Save the water for some other recipe (it goes great in smoothies) We like Simply Orange orange juice. Whatever you use, make sure the ingredients are simple and no sugar added. So tell me – what was your favorite frozen treat as a kid? Did you ever eat anything in an odd way Let me know in the comments! If you enjoyed this post, you may also like these! Oh summer is definitely here with a high of 102 here today! And these look great, I love the simple ingredient list and want to get a popsicle mold now. Thanks! Ha, I used to eat creamsicles the same exact way! Always ate the outside of sandwiches first, too. I didn’t know you could separate coconut milk that way. Cool! Since I’m not allowed to have creamsicles anymore, I’m excited to try this. Thanks for the recipe! I love creamsicles and this sounds so delicious! I also love that it’s a healthier version! Pinning! Sounds Yummy! Do they taste like coconut at all? I have two boys that can not stand coconut… not that I won’t be making these for everyone else but i was just wondering. Pinned! I didn’t notice too much of a coconut flavor. I think because it OJ and vanilla overpower it for the most part. 🙂 hopefully they don’t notice any taste! o0o0o this sounds grea! omg–i ate it in layers too!! I also used to eat the edges of ego waffles first before the middle parts…weirdos unite! haha! This sounds so good! I’ve been dying of heat (it’s only in the 80) being almost 20 weeks pregnant trying to plant a garden. I think I just found my Go To Recipe for summer treats! Delicious, easy to make, and nutritious – YES! I have to make these!! I LOVE creamsicles and since I’m trying to stay off sugar, this is definitely something I need to attempt STAT! Ugh sorry about your sugar drama, but sugar-free orange creamsicles totally win! It’s been 90-100F over here and this is a perfect excuse to enjoy this creamsicle. Ooh! These sound amazing, and I love how they are so simple to make, with very few ingredients. It’s not too warm here yet (aside from last week’s random heat wave), but I’ll definitely be pinning this for later! These sound great! I will definitely make these with my children. Thanks for sharing! My daughter tries to really limit the sugar my granddaughters consume, and of course they love frozen treats, so I will be sharing this with her. 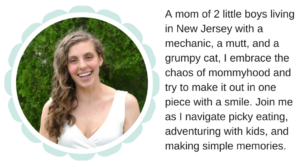 Thanks so much for sharing over at the Celebrate Your Story! link party! I am always happy to come and see what you have to share! I love creamsicles and yours looks delicious! and healthier too! I ate my creamsicles the same way, orange part first. My hubby wanted creamsicles a few weeks ago and the ones I bought were a huge disappointment. More orange popsicle, very little cream. They don’t make them like they used to do they? Thank you for the recipe. Such an easy, yet delicious recipe for a frozen treat! Thanks for sharing on Simply Natural Saturdays. Those sound so delicious! And you just gave me an idea….thanks for sharing another healthy treat! Cream sickles were my delight as a kid. When the ice cream truck would roll around the neighborhood, it was always my treat to purchase. Homemade ones are twice as yummy. Boy these popsicles sound so tasty, healthy and refreshing – great for the summertime heat. Being sugar free makes them extra special without all those chemicals in the store bought brands. Sharing. Sounds delicious – we JUST are starting summer now here in Seattle. Thanks for sharing with Simply Natural Saturdays. Your recipe has been featured on Full Plate Thursday this week. Enjoy your new Red Plate and have a great week! I used to eat Creamsicles in layers too! Love this tasty, healthier recipe. Scheduling pins to multiple boards and tweeted. Thank you for sharing with us at the Hearth and Soul Hop.